to read, and withhold your final judgment until you can see conclusive evidence. only be reached by traveling from Israel instead of going through Cairo. and feet became painfully swollen to such an extent that he couldn't get his fins on. choice but to return to Jerusalem to wait until their flight from Tel Aviv left for the US. put you up in a place to stay and even furnish your meals!" once at home, Ron began some serious research and study. EIGHTEENTH YEAR OF THE REIGN OF JOSIAH was this passover kept. disappeared from the Divine record sometime between 621 BC and 586 BC. the "house of the Lord"- it even mentioned small items like "spoons", etc. But the Ark isn't mentioned. wasn't among the returned items, this proves that it was never taken to Babylon . did any of those items include the Ark. verse further tells that the siege lasted over a year before the city was taken. "siege wall" have to do with the Ark? city- what were these weapons during this time? "towers" and "bulwarks" which shot "arrows" and "great stones". Catapults were capable of reaching over 1,000 feet, and therefore Ron reasoned that the siege wall would have been positioned out of the range of these massive devices, and therefore, further from the city wall than the site he had pointed to. 4) it was hidden somewhere within the confines of the city wall of Jerusalem and the Babylonian siege wall. The entire city AND the temple were destroyed in 586 BC by the Babylonians, so the Ark could have only escaped destruction or captivity by NOT being anywhere in the city. 2 Mac 2:2 The records show that it was Jeremiah who... 4,... prompted by a divine message, the prophet gave orders that the Tent of Meeting and the Ark should go with him. Then he went to the mountain from the top of which Moses saw God's promised land. 5 When he reached the mountain, Jeremiah found a cave-dwelling; he carried the tent, the Ark, and the incense altar into it, then blocked up the entrance. 6 Some of his companions came to mark out the way, but were unable to find it. 7 When Jeremiah learned of this he reprimanded them. `The place shall remain unknown', he said, `until God finally gathers His people together and shows mercy to them. 8 Then the Lord will bring these things to light again, and the glory of the Lord will appear with the cloud, as it was seen both in the time of Moses, and when Solomon prayed that the shrine might be worthily consecrated. "These same facts are set out in the official records and in the memoirs of Nehemiah. Just as Nehemiah collected the chronicles of the kings, the writings of prophets, the works of David, and royal letters about sacred offerings, to found his library, so Judas also has collected all the books that had been scattered as a result of our recent conflict. These are in our possession, and if you need any of them, send messengers for them." Also worthy of note: the quote in 2 Maccabees, above, could have been mis-translated over the years and originally have stated that the Ark was hidden NOT IN the mountain Moses was ON when he viewed the promised land (Mt. Nebo, Deu. 32:49), but instead it could mean that the Ark was hidden IN the mountain that Moses SAW when he viewed the promised land. From Nebo he would have been able to see Jerusalem because of it's altitude. In the Pseudepigraphal book called "The Paralipomena of Jeremiah" (meaning "the remaining words of Jeremiah") it is also written that Jeremiah, in obedience to God's command, hid the sacred objects from the temple just before the destruction of Jerusalem. Now, neither of these books are to be trusted as completely accurate- however, they do show a strong tradition that has Jeremiah hiding, or having someone else hide, the Ark and other objects from the temple. Is there any truth in these 2 books? 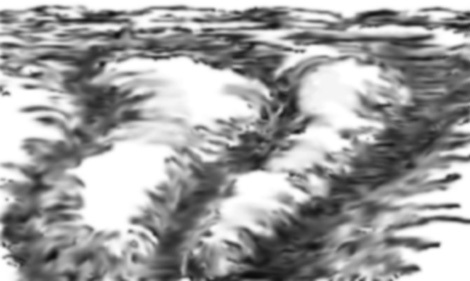 Perhaps- since Jeremiah WAS the prophet in Jerusalem during the time of Josiah (when the Ark was brought back into the temple) and he continued through to the time of the destruction of Jerusalem, it is logical to believe it possible that God directed him to have the Ark and other sacred items hidden. The "land of the north" was Babylon where they would soon spend 70 years in captivity. If this understanding is correct, it indicates that Jeremiah DID have knowledge that they would no longer have the Ark when they returned from Babylon. But also important to note is that he CLEARLY indicated that "neither shall that be done ANYMORE", which is proof that there is no promise of it ever being reinstated. In fact, in Ezekiel, when he gives the instructions for the temple, he gives NO instructions which included the Ark. It was never mentioned. Since Jerusalem was surrounded by the Babylonian siege wall during the time the Ark seemed to have disappeared, Ron believed it may have been possible for someone to have taken it to a location within the siege wall and not be detected. The quotes we read above agree with the "time", but we just don't know for sure- and again, these books are not inspired so we cannot rely on them. Jerusalem is situated on 2 hills, traditionally referred to as "Mt. Moriah" and Mt. Zion". To the extreme right can be seen the beginning of the Mt. of Olives. 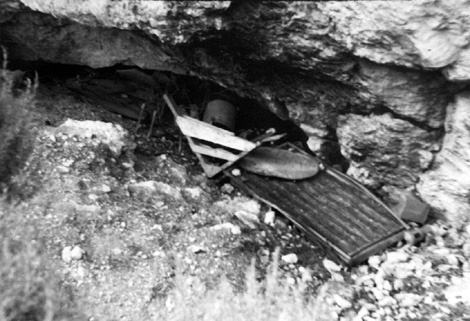 The quarry which contains the site Ron was to excavate is part of the northern extension of Mt. Moriah. 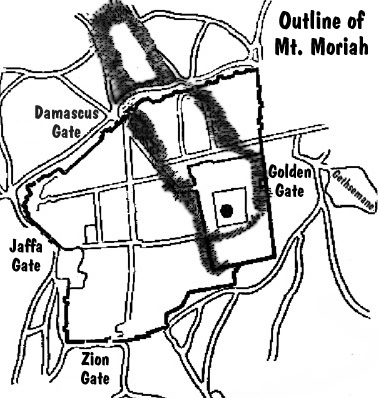 On the east, south and west sides of Jerusalem are very deep valleys which protect the city from foreign invaders. But on this north side, they were vulnerable. Therefore, a "dry moat" or trench was quarried out of "Mt. Moriah" on the north side to prevent an enemy from being able to simply reach and break through the wall along this ridge. Then, at some unknown point in time, the northern portion of "Moriah", now separated from the city, was used as a stone quarry. Starting on the south end of this now separated part of "Moriah", on the western side, stone was cut out of the mountain, lowering the ground level to that of the trench which extends just outside of the north wall. The site Ron pointed to was along the quarried face (escarpment) of "Mt. Moriah". 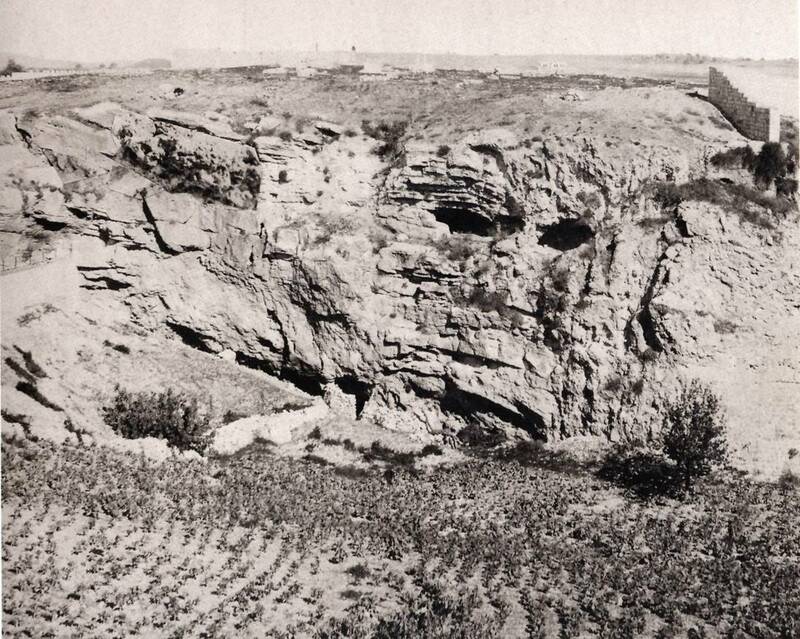 This cliff-face is referred to by some as "the Calvary escarpment" because it contains the "skull-face" that many believe was "Golgotha" or "Calvary" where Christ was crucified. It also contains the site traditionally called "Jeremiah's Grotto", the "Garden Tomb" (where many believe Christ was buried) and St. Etienne which contains a large complex of Jewish tombs dating to the 1st and 2nd temple periods cut into the side of the mountain. The escarpment is many hundreds of feet long. And it was Ron's belief that this WAS the general area of the crucifixion, and the Garden Tomb, he also believed, was indeed that of Joseph of Arimathaea which had once held the body of Christ. But these things were not related to this project. He was now searching for the Ark of the Covenant. The Discoveries of Ron Wyatt.